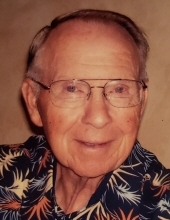 Norman Thomas "Tuck" Matthews, 90, passed away peacefully on April 12, 2019. Tuck was born May 31, 1928 in Pocomoke City, Maryland moving to Portsmouth as a young boy. He was a Boy Scout, played basketball and baseball. He graduated from Craddock High School in Portsmouth where he was a standout football player. He was voted to the prestigious All Tidewater Team of the Tidewater Football League. Tuck remained active his entire life spending many hours on the tennis court and golf course. After high school, during World War II, Tuck joined the Army and served in Manneheim, Germany specializing in radio communications. Upon his return from the service he began working at the Portsmouth Star in advertising sales. Soon after beginning his newspaper career he met another employee, Almarie Casper and quickly swept her of her feet. They were married within three months on November 6, 1953. Tuck became quite skilled and well respected as advertising manager and retired after 45 years as a Vice President of Landmark Communications. Tuck is a devout Christian and a decades long member of Deep Creek Baptist Church where he served as a deacon, Sunday School teacher and on various committees. He was preceded in death by his beloved wife of 58 years, Almarie Casper Matthews; mother Bertie Dunton Beaver; and brother Francis W. "Pete" Matthews. He is survived by his daughters, Rebecca Brannock and Amy Clark (David); grandchildren, Matthew Brannock, Lindsay and Zachary Clark; and great grandson, Mason Tucker Brannock. The family would like to express our sincere thanks to the staff at Cedar Manor in the assisted living and memory care units for their kind and loving care given to our father these last three years. A funeral service will be conducted on Thursday April 18, 2019 at 1PM at the Sturtevant Funeral Home Portsmouth Blvd Chapel. Interment will follow at Olive Branch Cemetary. The family will receive friends Wednesday evening from 6-7:30PM at the funeral home. In lieu of flowers donations may be made to The Union Mission, Gideons International or Deep Creek Baptist Church. To send flowers or a remembrance gift to the family of Norman T. "Tuck" Matthews, please visit our Tribute Store. Guaranteed delivery before Norman's funeral service begins. 2 Cpl J M Williams Ave.
"Email Address" would like to share the life celebration of Norman T. "Tuck" Matthews. Click on the "link" to go to share a favorite memory or leave a condolence message for the family.